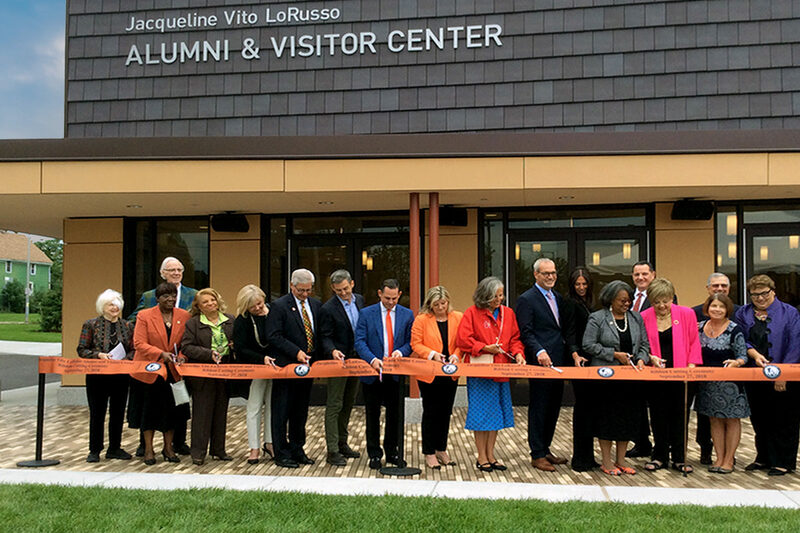 The new Jacqueline Vito LoRusso Alumni and Visitor Center at SUNY Buffalo State is now open. The newly constructed building will serve as the gateway to the campus for visitors, returning alumni, and prospective students and their families, and will provide a venue to deliver programming, mentoring, and engagement opportunities. Trowbridge Wolf Michaels provided landscape architecture design and construction documentation for the project. This included strategically locating the building at a highly visible corner, inviting visitors to enter and explore the building. Interior floor patterns extend to outdoor paved terraces, creating a seamless visual experience. Movable furniture allows for flexibility for a range of event types.